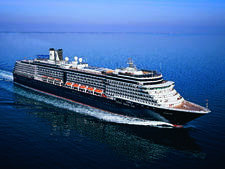 Eurodam, which debuted in 2008, is a classic example of Holland America's attention to architecture, design, dining, enrichment and entertainment. And although some of the ship's public spaces are starting to look a bit outdated, the feel of the ship is still as relevant today as it was on its inaugural voyage. It's elegant, understated and mature. 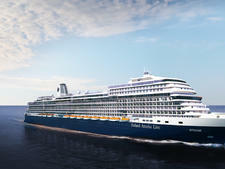 Much of Eurodam's decor is a nod to the line's Dutch heritage and the traditions of sailing from years gone by. 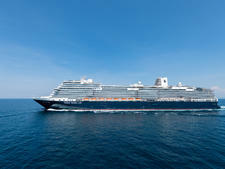 The artwork throughout the ship is filled with masterpieces of Rembrandt and other Dutch artists, as well as maps of the world, and classic black and white photos depicting cruising on Holland America Line through the years. The 360-degree Promenade Deck features traditional teak chaise lounges and plaid blankets that are reminders of the romance of sailing from eras gone by. But there are plenty of modern-day amenities and spaces that blend in perfectly including the rockin' Memphis-and-Motown band in the B.B. King Blues Club, the classical music of Lincoln Center Stage and cooking demonstrations and classes in America's Test Kitchen. 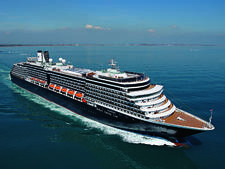 Speaking of the entertainment onboard Eurodam, it's top-notch and stays true to the quality Holland America has committed to. 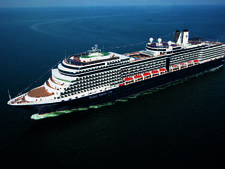 Aside from Eurodam's musical and culinary demo venues, there are Broadway-style productions, concerts, comedians and magicians and full sensory BBC Earth Experiences in The Mainstage plus contemporary movies in the Screening Room. Enrichment programs go on throughout the day including computer workshops and classes, cooking classes, fitness seminars and wine tastings. 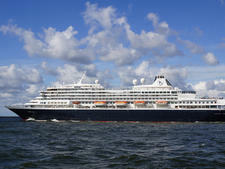 Service on Eurodam is consistently stellar. From the cabin stewards to the waiters, affable bar staff and friendly entertainment and cast members, the service is attentive and friendly. 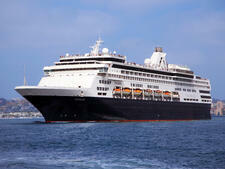 The ship generally feels uncrowded, except for breakfast and lunches in the Lido Market at high-volume times. But there are so many dining options for all meals, that it's easy to escape the din. 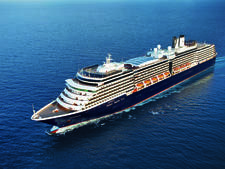 Passengers on Eurodam follow suit with the majority of Holland America's passengers -- 60-plus, middle-to-upper income, well-traveled and open to new adventures. 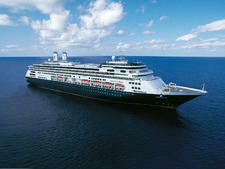 Beyond that, passengers vary, depending on the ship's itinerary and the time of year. 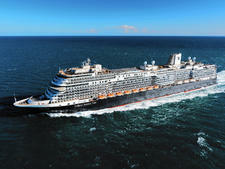 Holidays, summers and the Caribbean and Alaska seasons tend to bring more families. Our Alaskan itinerary had 221 children, which is about average for a summer sailing in the region. 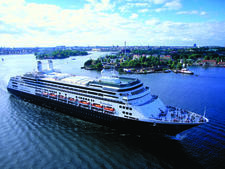 European and Alaska itineraries may bring a few more Europeans and Australians to Holland America, but, for the most part, the majority of passengers are from the United States. Cruise Critic’s professional photographers and our extraordinary community members have taken 2,407 pictures of Holland America Eurodam. When you visit our photo galleries, you can be assured that what you see is what you get. The overall dress on Eurodam is resort casual. 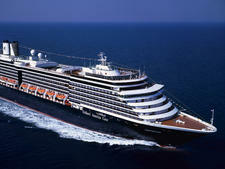 Daytime wear is quite casual with bathing suits around the pool and shorts and jeans around the ship being de rigueur. Evenings were a notch above with men typically wearing khaki-style slacks and button-down shirts and women wearing slacks and skirts (or sundresses on warmer itineraries). 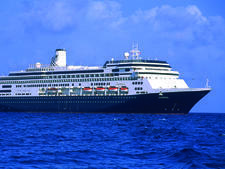 Formal nights on Holland America are called Gala Nights, which seems to be a better representation. Many passengers use Gala Nights as an excuse to pull the tuxedo and gown out of the closet and strut their stuff. Others simply go with a more traditional suit and cocktail dress. Both are equally appropriate and expected. 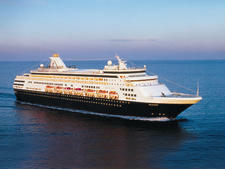 There are typically two Gala Nights on a seven- to 13-night cruise, with three or four on longer sailings. 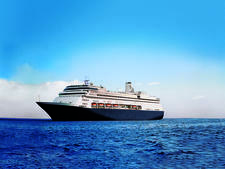 The automatic tip for passengers staying in interior, ocean-view and veranda cabins is $14.50 per person, per day and is automatically charged to your stateroom account. Passengers in suites are charged $16.00 per person, per day. A 15 percent gratuity is automatically added to bar bills, dining room wine purchases and spa services.